High-altitude activities may not be off limits for people with cardiovascular conditions, with researchers compiling clinical recommendations to promote safe access to mountainous regions. In a recent joint statement, the European Society of Cardiology and its Council on Hypertension, the European Society of Hypertension, the International Society of Mountain Medicine, the Italian Society of Hypertension and the Italian Society of Mountain Medicine, provided a review of available evidence to promote safe access to high-altitude environments, which were defi ned as higher than 2500 m above sea level. The recommendations, published in the European Heart Journal, covered heart failure, ischaemic heart disease, systemic arterial hypertension, arrhythmias and implantable devices, pulmonary hypertension and congenital heart disease, as well as cerebrovascular conditions. For example, the researchers recommended that patients with ischaemic heart disease should wait at least six to 12 months after coronary stenting before heading for high-altitude areas. 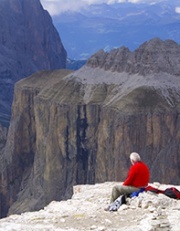 In another recommendation, they noted that patients with stable New York Heart Association (NYHA) class I to II heart failure may safely reach altitudes up to 3500 m, those with stable NYHA III heart failure may reach 3000 m if needed, whereas those with unstable NYHA IV heart failure should avoid high-altitude exposure. The researchers acknowledged the ‘soft’ nature of much of the available evidence but hoped the review might allow for safer exposure to hypobaric hypoxia at altitude for people with various cardiovascular conditions. Associate Professor Andre La Gerche, Head of Sports Cardiology at the Baker Heart and Diabetes Institute, Melbourne, said the paper was an interesting summary of existing knowledge and reflected common sense. ‘Essentially, the higher you go, the more of a stress on the body; therefore, the more underlying conditions you have, the more you should be careful,’ Professor La Gerche told Cardiology Today. Professor La Gerche noted that only a small number of older Australians would be seeking to scale mountains higher than 2500 m, and they would have to travel overseas to do so. Professor La Gerche questioned the researchers’ recommendation that acetazolamide may be beneficial in people with cardiovascular disease exposed to high altitudes. He said the golden rule with altitude was to increase the amount of altitude very gradually. ‘And if there are any concerns or cardiovascular issues, that needs to be reinforced tenfold,’ Professor La Gerche said. Eur Heart J 2018; 0; 1–11; doi:10.1093/eurheartj/ehx720.